For almost every engineering job, there’s an engineering tech position to support it. The scope of work is much more limited for an engineering technician than an engineer, but they get to be involved in so many important and interesting projects. When you first start out, you’ll work with complete supervision. As you grow and gain experience, you’ll eventually become the one supervising. Find out about all the different engineering technician careers and how to get into them. You’ll support mechanical engineers by helping to design, develop, and test tools, engines, machines, and other mechanical devices. This is one of the broadest engineering fields. With this degree, you can work anywhere from patent law to materials testing to design. At first, you’ll work closely with, and under very watchful eyes of, the mechanical engineer or team of specialists. Once you’ve gained enough work experience, you’ll have more autonomy. You must have either an associate or bachelor’s degree to work as a mechanical engineering tech, along with a period of on-the-job training. The median annual wage is $55K, with a slower than average employment growth through 2026. You’ll work in mechanical or industrial facilities where you will assist with efficiencies in productivity and safety. You’ll make recommendations and help to implement the required changes. You support the industrial engineers in their efforts by testing and inspecting the facility’s equipment. Your exact duties will depend on who you’re working for, and you may also be in charge of training, performing audits, inspections, keeping with compliances, and making recommendations based on findings. You can get the proper training through a vocational/trade school or a community college. The median pay is $54K, and the outlook for employment growth is stagnant. Once a clear plan is developed by an environmental engineer, you’ll help carry it out. Work will keep you mostly indoors, but sometimes you’ll help do clean ups at outdoor spill sites. You will perform environmental quality testing, set up equipment, collect samples to conduct surveys of the air or ground water, and help find the sources of pollution. You’ll also work in laboratories where you’ll record test results, take photographs and other forms of documentation, and create reports. You must have an associate degree through an accredited program. The median pay for your field is $50K, and the employment outlook is predicted to grow 13 percent through 2026. Infrastructure and a variety of land development projects are planned out by civil engineers, and you will work under their supervision to support the project. Your duties will be varied depending on your employer. Until you’re licensed, you don’t have authority to approve or supervise. You should get an associate degree, but there are certificate of completion programs available through trade schools that may be equally acceptable. Additional certification isn’t necessary, but you can choose to get some if you want to have advancement opportunities. You’ll find options through the National Institute for Certification in Engineering Technologies. Median annual pay for your career is $51K, and the employment outlook is predicted grow 9 percent, which is about average compared to other occupations. You get to help engineers design and develop computers, communication and navigational equipment, medical devices, and more. You’ll work in the product evaluation and testing end, as well as repairing and adjusting the equipment. Blueprints, schematic drawings, instructions, reports, and data recording are all in a day’s work. Go to community college and get an associate degree, or head to trade school in order to work as either an electrical or electronics engineering technician. You’ll earn a median salary of $63K, and there will be about 2,700 jobs available. You’ll increase your employment chances if you are certified. As a computer engineering tech, you’ll assist the computer engineer as they design hardware and software. You will also help consumers troubleshoot problems with their software and hardware. It’s not uncommon for computer engineer techs to work as network support specialists for an IT department. For entry level positions, you must have an associate’s degree. If you’re looking for a bit more, then you should think about getting a bachelor’s degree. The median annual salary is $54K for this career, and job growth is predicted to be slower than average through 2026. You’ll be qualified to assemble, install, calibrate, troubleshoot, test, maintain, and repair new and old air and spacecrafts and all their parts. If a craft crashes, you will be part of the team deciphering what went wrong. You help to ensure that any test operations run safely. Post-secondary education, whether an associate degree or certificate, will make you more attractive to hiring personnel. Find an accredited program that offers work experience in the curriculum. Aerospace engineer and operations techs’ income is higher than most other engineering tech professions, with a median salary of $68K. As you gain experience, your salary can reach into the $100Ks. Average job growth is expected through 2026, with about 800 new positions opening. Whether it’s a concert, tv broadcast, radio, or Broadway musical, you’re there to set up, maintain, and operate that sound equipment. You also make sure that the sound and imagery is in sync for broadcasts, convert live broadcasts over to digital recordings, install custom systems, and work with all the components relevant to the project. You will need to get an associate degree from an accredited program, which should also include hands-on learning in the curriculum. The technology is constantly evolving, which means you’ll need some continuing education to keep up the changing times. The Society of Broadcast Engineers offers eight voluntary certifications. These are not required but highly recommended, especially because it’s such a competitive field. The median yearly salary is $42K, and with more years of experience you can earn more than $85K. Average employment growth is predicted for broadcast and sound engineering technicians, with 10,700 jobs opening through 2026. What your actual job entails will be determined by the facility you’re employed with. You’ll support the scientists and engineers by monitoring the performance of the equipment, keep track of radiation levels and any potential hazards, ensure all the monitoring equipment is not faulty, collect air and soil samples surrounding the facility, and any other duty on your plate. An associate degree or equivalent military experience is required to get into this profession. On-site training can last between six months and two years, depending on what your background is. Certifications are available through the Nuclear Energy Institute, the American Society for Nondestructive Testing, and the National Registry of Radiation Protection Technologists. They are voluntary but recommended, especially in this competitive job market—the projected job outlook shows very little growth for the field. You can expect a median annual salary of $80K. Learn about becoming an engineer. A breakdown of some of the more popular engineering technician careers. Most of the classical engineering fields such as civil, mechanical, chemical, and electrical all need the Professional Engineering designation to be considered one. In some instances, you can be considered an engineer just by moving up the job ranks through the years: While you may not be considered an engineer in the traditional sense of the word, sometimes experience speaks louder than a piece of paper. 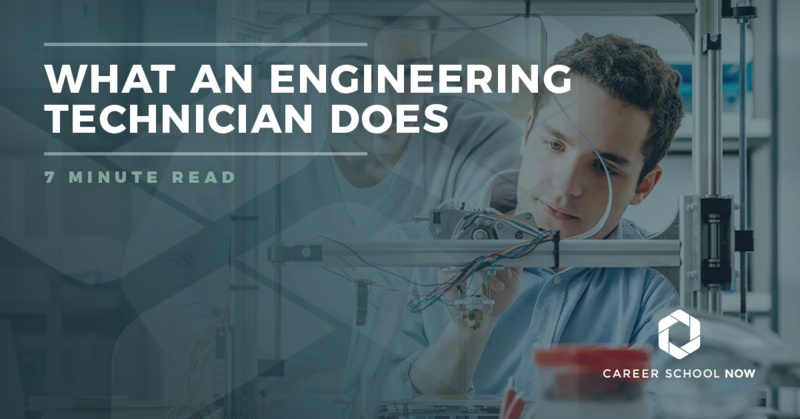 Electrical engineering could be the easiest route to take from engineering tech to engineer, because it’s not as regulated as many of the other engineering fields. So, in a roundabout way, you can be called an engineer. Still, getting your engineering degree is the quickest path to go from point A to B if you desire to advance your career.